Jellyfish Coral for Merriment Mini Fairy Gardening. Full Description: Designed by artist Mary Engelbreit, this lively pair of blue jellyfish reside in a colorful reef with a friendly blue crab. 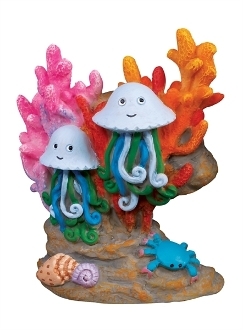 This piece's bright colors will be a beautiful addition to an underwater mini garden! Made of resin with all-weather paint. Underwater safe.